In case you haven’t been in a grocery store, pharmacy, craft store, department store, or just about any other store in town, this Thursday, February 14 is Valentine’s Day. We thought we’d give you one more “heads up” about making plans for your Valentine gifts. 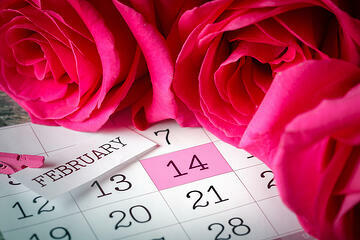 We’re also supplying some interesting facts about the history of Valentine’s Day. Our friends at History.com have provided a list of facts about the honored Saints, yes there are more than one. Officially recognized by the Roman Catholic Church, St. Valentine is known to be a real person who died around A.D. 270. One account from the 1400s describes Valentine as a temple priest who was beheaded near Rome by the emperor Claudius II for helping Christian couples wed. A different account claims Valentine was the Bishop of Terni, also martyred by Claudius II on the outskirts of Rome. Enough confusion surrounds the true identity of St. Valentine that the Catholic Church discontinued liturgical veneration of him in 1969, though his name remains on its list of officially recognized saints. The saint we celebrate on Valentine’s Day is known officially as St. Valentine of Rome to differentiate him from the dozen or so other Valentines on the list. The official Roman Catholic roster of saints shows about a dozen who were named Valentine or some variation thereof. The most recently beatified Valentine is St. Valentine Berrio-Ochoa, a Spaniard of the Dominican order who traveled to Vietnam, where he served as bishop until his beheading in 1861. Pope John Paul II canonized Berrio-Ochoa in 1988. There was even a Pope Valentine, though little is known about him except that he served a mere 40 days around A.D. 827. Saints are certainly expected to keep busy in the afterlife. St. Valentine has wide-ranging spiritual responsibilities. People call on him to watch over the lives of lovers, of course, but also for interventions regarding beekeeping and epilepsy, as well as the plague, fainting and traveling. As you might expect, he’s also the patron saint of engaged couples and happy marriages. The medieval English poet Geoffrey Chaucer often took liberties with history, placing his poetic characters into fictitious historical contexts that he represented as real. No record exists of romantic celebrations on Valentine’s Day prior to a poem Chaucer wrote around 1375. In his work “Parliament of Foules,” he links a tradition of courtly love with the celebration of St. Valentine’s feast day–an association that didn’t exist until after his poem received widespread attention. We wish you a great Valentine’s Day. When you have questions about insurance, we’re here for you. Give us a call.